Are You A Good Candidate for Invisalign in Fort Worth? The image of the Wild West is synonymous with Fort Worth. The rugged individualism, dogged determination, and sheer grit it takes to tame a hulking, bucking animal is regarded by the locals as the quintessential Texan. Examples of this type of person dot the city in both imagined and real forms. Pretty much everyone can describe them to you off the top of their head. An iconic image of this character is after they have conquered the animal, smiling at the unexpected triumph over nature, hat tipped back to reveal a not often revealed smile, gleaming white. One thing that no one expects is for them to have braces. It’s just not how Texans like to imagine themselves, even though they often become necessary in the real world. However, thanks to West 7th Smiles, you and everyone else now have access to Invisalign in Ft. Worth. Your dentist in Fort Worth will evaluate your teeth and see if you are a good candidate for Invisalign. A dental impression will be taken and sent to a lab in order to create your series of alignment trays that will gradually straighten your teeth. You will wear each tray for a few weeks before progressing to the next one, with your dentist monitoring your progress throughout. The whole process lasts anywhere from 10-18 months. The Invisalign system has multiple advantages over tradition braces. Firstly is comfort for the patient. Traditional braces often irritate the gums and cheeks because metal is very rigid, and is installed to force your teeth into alignment. 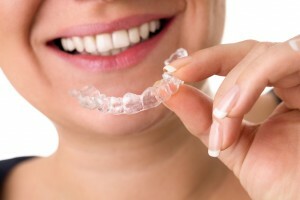 Invisalign, on the other hand, is custom made with moldable plastic to fit your teeth every step of the process. The trays are also removable, which facilitates eating and oral hygiene, an attribute not available with brackets and wires. This means you do not have to alter your dietary habits while straightening your teeth. Invisalign also works faster than traditional braces. It usually takes years for metal braces to get your teeth where they need to be, where Invisalign can take less than one year. And last but not least, Invisalign helps preserve your image that is so important to your personal and professional life. Only Ugly Betty has been able to pull off traditional metal braces, but there are not many following in her footsteps. Cosmetic dentistry in Fort Worth has advanced a lot over the years. The only way to figure out if Invisalign can help your smile is by visiting Dr. Boyd at West 7th Smiles. They may determine that a different cosmetic procedure is best for you. Invisalign is not the solution for damaged or missing teeth, but West 7th Smiles has other services which can address these problems. If you are looking to straighten your teeth in a way that is quick and comfortable, then Invisalign might be the answer for you. Comments Off on Are You A Good Candidate for Invisalign in Fort Worth?